Termination of voice traffic in Sierra Leone is a promising direction for the telecommunications business, which allows making $600 via one channel of equipment. In order to terminate calls in this direction, transit operators are ready to pay $0.18 per minute. However, it is important to protect your SIM-cards from blocking because in the country there is quite a tough antifraud. You should also pay attention to choosing the optimal tariff plan for outgoing calls to have your earnings maximized. Africell starter packages will be an excellent choice. Africell is the largest GSM operator in Sierra Leone as the number of its subscriber base has exceeded 3.5 million people. The cost of a new-SIM card is about $2.4, as well as starter packages are available throughout the country. They can be purchased at almost any kiosk or supermarket. Africell offers prepaid customers quite favorable tariffs on national calls. The cost of a minute of an on-net call is $ 0.08 from 4:00 p.m. to 1:00 p.m. At night, from 1:00 a.m. to 4:00 a.m., calls to Africell numbers are absolutely free. Call to the number of any other operator will cost the subscriber $0.09 per minute, regardless of the time of day. Africell also has comprehensive bonus packages: KOSOMBO BOMBA BUNDLE. This is a whole line of "3 in 1" tariff plans, which provide for a certain number of minutes, SMS, and Internet traffic at a fixed monthly fee. There are six packages in total; the maximum number of minutes provided is 70. The cost of connecting KOSOMBO BOMBA BUNDLE for 70 minutes is $3.94. Using the package, one minute of the outgoing call will cost a terminator $0.05. 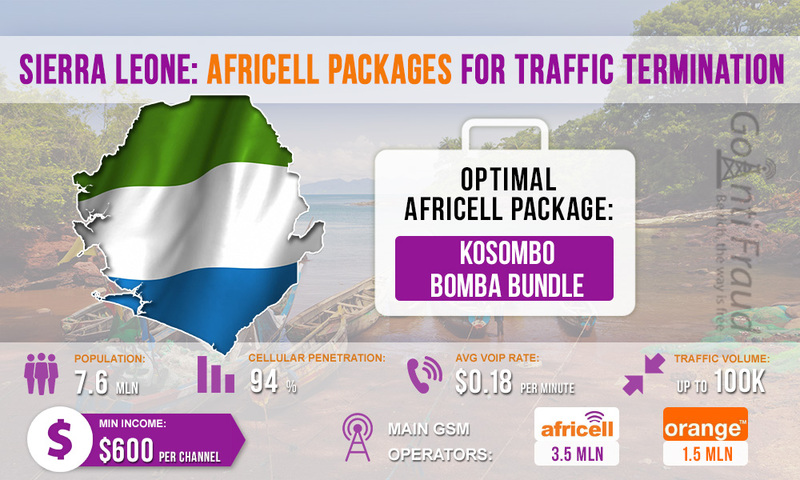 We recommend using KOSOMBO BOMBA BUNDLE for GSM termination in Sierra Leone to make unlimited calls at night. With voip r call rates of $0.18 per minute, you will earn about $600-700 per channel if you terminate 200 minutes a day.